Inductee and Award Recipient Profiles: As anticipation for the 2018 Induction and Award Ceremony grows IPHF will feature a new profile from an 2018 honoree each week. The 2018 Hall of Fame Induction and Award Ceremony will be held October 26th, 2018 at the .ZACK in Grand Center. When John Loengard was eleven years old, his father bought the family a brand new box camera. Loengard was hooked. He went from developing his first roll of film in the bathroom to becoming his high school’s newspaper photographer. Loengard was a senior at Harvard College in 1956 when Life magazine’s Boston bureau-chief Will Jarvis asked him to photograph a cargo ship that had run aground on Cape Cod in a storm. Though Life did not use the pictures, the assignment began his relationship with the magazine. After two years in the army, he joined the photographic staff of Life magazine in 1961, though he still was not happy with the pictures he was taking. That is, until 1964 when a quiet coup overturned the government in Brazil. A few days later, with nothing camera-worthy happening in downtown Rio de Janeiro, he sat on Copacabana beach and took a picture of a man there. When he developed the photo back in New York, Loengard realized he had found his style. The photographic essays he did on painter Georgia O'Keeffe, his portraits of the Beatles, poet Allen Ginsberg, and actor Bill Cosby became classics. 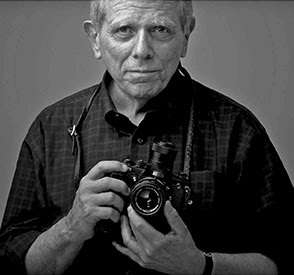 American Photographer magazine identified him in the 1970s as “Life's most influential photographer.” He was instrumental in the startup of Life as a monthly publication. In 1987 Loengard left to become a freelance photographer, full time, publishing four books about his own photographs and six concerning the work of other photographers. Today, he still uses a digital camera or an iPhone, rather than the box camera and bathroom he began with. My lens still marries reality to form, and my camera records their marriage. Their wedding is the moment. A proper moment still means the world to me. All images © 2018 John Loengard except Loengard portrait: © 2018 Joe McNally. All rights reserved.